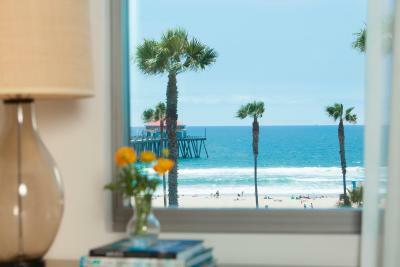 Lock in a great price for Kimpton Shorebreak Huntington Beach Resort – rated 9.2 by recent guests! Friendly staff, very accommodating, comfortable bed, loved the atmosphere. Definitely coming back! I actually was so put off by the “under/next to the CVS” icky strip mall entrance that we didn’t stay. No pool. Beach access is to dirty public RV spaces on other side of busy road! Ugh! Amazing location, very pretty and clean hotel with comfortable rooms. We loved our room with a view and after mentioning it was our anniversary they surprised us with flowers and champagne which was very much appreciated. I always enjoy staying here. Friendliest most helpful staff you could ask for, excellent service. Super helpful staff. Everyone was so friendly and willing to help make our stay excellent. We asked to change rooms on our second night so we could enjoy a more comfortable bed and the front desk was so great to find the room and help us move during a busy night. Great location, beautifully turned out with plenty of activity/lounging areas! Fabulous room and bathroom, comfy beds! Location, valet & front desk staff were friendly, good bartenders. Love the location, the appearance of the hotel, lobby and facilities, rooms are awesome, view was awesome, staff is super friendly. We love everything about this hotel, well maybe it could be a little bit cheaper, we spent almost a thousand for two days with parking. they sent a special surprise to our room for our 25th wedding anniversary. very thoughtful. I love the free beach chairs, umbrellas and bikes. So awesome. 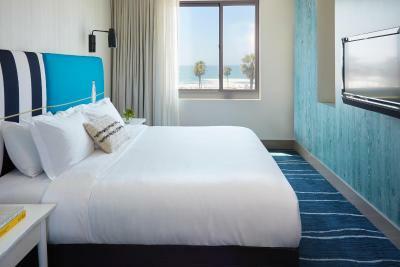 Kimpton Shorebreak Huntington Beach Resort This rating is a reflection of how the property compares to the industry standard when it comes to price, facilities and services available. It's based on a self-evaluation by the property. Use this rating to help choose your stay! 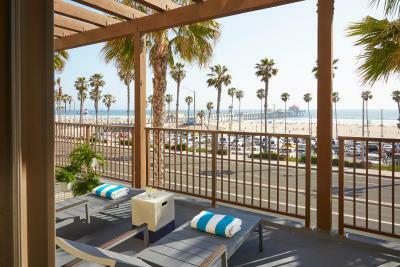 Steps from the Pacific Ocean, entertainment and the vibrant beach-side nightlife of Huntington Beach, this updated boutique full-service hotel offers state-of-the-art amenities, including a modern fitness center and an on-site bar and restaurant. 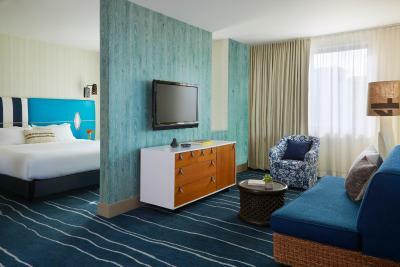 All guest rooms at Kimpton Shorebreak Hotel feature a flat-screen TV, a work desk with an ergonomic chair, animal print guest robes and a yoga mat. Guests can enjoy a menu of Latin American and Asian flavors at Pacific Hideaway, which offers culinary and design inspiration from global surf destinations around the Pacific Rim. 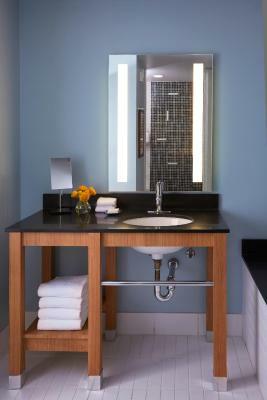 Kimpton Shorebreak Hotel offers a variety of modern amenities and facilities. Enjoy the fitness centre, complete with a yoga studio and a 40 foot rock-climbing wall. Relax by one of the outdoor fire pits. Allow the concierge staff to arrange activities or bicycle rentals. 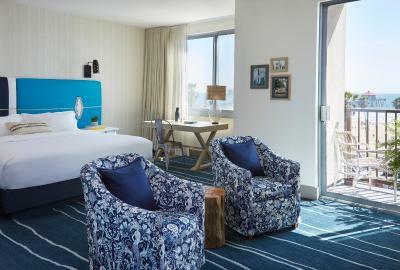 Located at the famous intersection of Main Street and Pacific Coast Highway, Kimpton Shorebreak Hotel is seconds from a variety of attractions and activities. Take advantage of nearby shopping, gourmet restaurants and endless beach and water activities. John Wayne Airport is a 22 minute drive away. 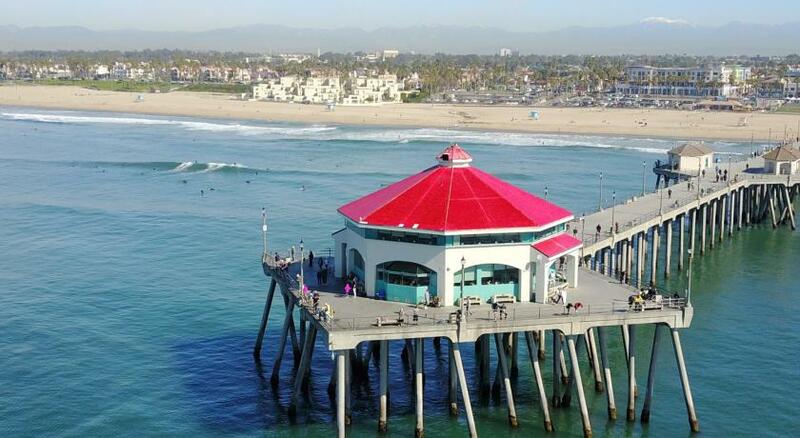 When would you like to stay at Kimpton Shorebreak Huntington Beach Resort? This room features views of the hotel's interior courtyard and fire pits or the surrounding neighborhood. The room is furnished with one queen-size bed. Maximum occupancy is 2 people total (see Hotel Policies). Offering a balcony, this air-conditioned deluxe room includes a flat-screen TV, a work desk with an ergonomic chair, animal print robes, a mini-bar and a yoga mat. Maximum occupancy is 4 people total (see Hotel Policies). 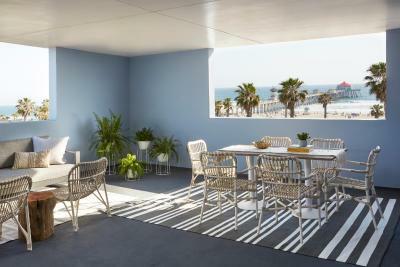 This updated quadruple room features a balcony, sea view and air conditioning. This updated double room has a mini-bar, patio and bathrobe. This updated suite features a balcony, mini-bar and sofa. This updated suite has a balcony, bathrobe and mini-bar. This air-conditioned deluxe room includes a flat-screen TV, a work desk with an ergonomic chair, animal print robes, a mini-bar and a yoga mat. While bed type is not guaranteed and subject to availability the property will attempt to match the guest's preference. 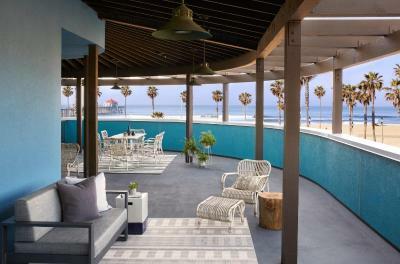 House Rules Kimpton Shorebreak Huntington Beach Resort takes special requests – add in the next step! Kimpton Shorebreak Huntington Beach Resort accepts these cards and reserves the right to temporarily hold an amount prior to arrival. No doors on the bathroom! It's a STUPID design trend and shame on them for allowing their designers to wreak havoc on their guests. They have some flimsy barn door slider instead of a door to the bathroom, and it doesn't lock shut, doesn't provide any sound or smell proofing, and you can see through the sides of it pretty easy. Plus it bounces open really easily. Nothing to hate. Everything was perfect! Everything! Local to beach, restaurants, bars, shops, etc! We had a pleasurable time and are looking forward to returning soon! No place for the animals to pee! Was REALLY disappointed with the dinner from the resto - had the pad thai with shrimp and the lettuce wraps - super lacking especially given price. Was surprised. LOVED the property in general, the common spaces, my room was awesome and had a huge deck. Breakfast at the resto was GREAT but dinner was def NOT. See below. dog beach too far away, I am 71...too far for me to walk. A little pricey.